OMG, Whatever Took Me So Long? When I was preparing to teach my 6 day dye class at Kenderdine Campus at Emma Lake in 2011 I pulled my resource books for natural dyes and ordered several recent publications. India Flint’s book was always listed as a new favorite, no matter which on-line bookseller I checked out – much to my dismay – the book was never in stock. While judging and teaching in Winnipeg I came across an actual copy, but with my luggage teetering near the overweight limit I opted against purchasing. It was difficult not to alter my decision as the book’s images and comprehensive information was on my mind constantly. I ordered a copy in early May and have not put it down since it arrived in my post office box. This passion for natural dyes diminished somewhat when I discovered Procion dyes, Indigo and quilting. India flint has rekindled my interest in natural dyeing with her innovative approach to incorporating everyday dye stuff to achieve unique and complex results on various fabrics, threads and fleece. The inside jacket flap sums it up so eloquently: India explores the fascinating and infinitely variable world of plant color using a wide variety of techniques and recipes… She uses renewable resources and shows how to do the least possible harm to the dyer, the end user of the object, and the environment. My new favorite natural dye “bible” is made up of eight distinct parts, covering topics from identifying to collecting the plants, setting up the workspace with equipment, the preparation, processing and application of the dyes. India devotes an entire chapter to “Eucalyptus and beyond”. Part Six covers special effects from cold and hot bundled eco-prints, Hapa-zome, dyeing wool sliver and yarn to the application of resists, solar dyeing and incorporating mud and… yes, you are reading it correctly: cow patties! Part Seven rounds out the in-depth information with considering water origin and quality, time management, the care for cloth as well as the disposal of dye waste. A well-researched reference chapter completes the book. 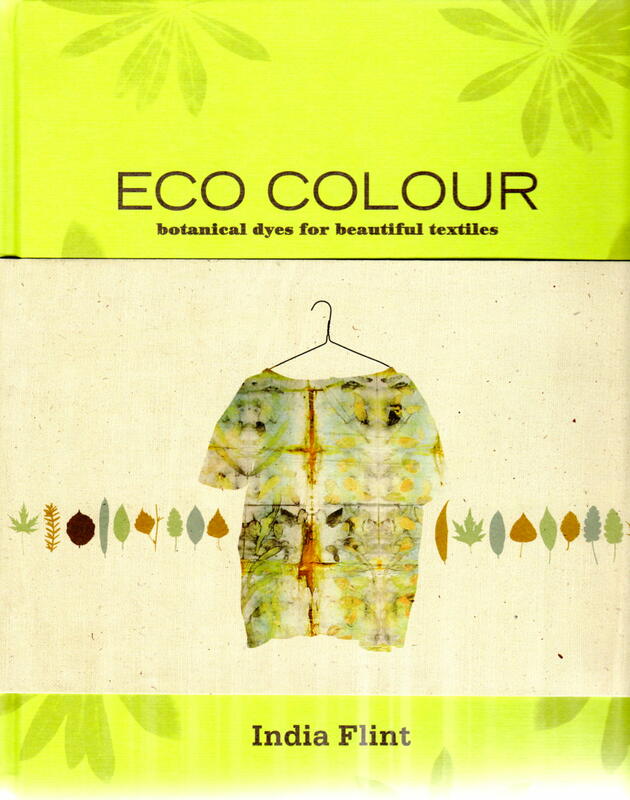 I would love to share some of the inspiring images that set this book apart from any other natural dye resource I own or have previously laid my hands on – but you will just have to check a copy out of the library or even order your own! 12 Jun	This entry was published on June 12, 2012 at 6:11 am. It’s filed under Book Review, Creativity Update, Nature's Art and tagged book review, Eco Colour, India Flint, Interweave Press, Natural dye stuff, new twist on an old theme. Bookmark the permalink. Follow any comments here with the RSS feed for this post. Thanks for the link, Elaine! A n excellent way to find more time is to meditate for an hour before bedtime. An hour of meditation is equivalent to about 3 to 4 hours of sleep. So you can exist on less actual sleep and gain some much needed extra hours. Has worked for me for years. Plus good time planning . We always underestimate the time it takes to do a project. why is that? Also I have finally admitted to myself and am now ok with it, is that I cannot do it all. So I do a lot of prioritizing. Congratulations on your show. Just amazing and so inspirational! Serafina, meditation is great – I can manage 30 minutes maximum, at night I often fall asleep meditating. When I teach I do my utmost to start and end the day with a brief meditation session. When extra time allows I sneak in about 10 minutes at lunchtime – it works wonders and helps me keep my energy level up. India Flint is inspiring–I bought her book and I don’t even dye cloth! While you’re smelling the daisies, make sure to grab a few for your next dye bath! Carol, I will! So many exciting possibilities and so little time! Hi Anna, You get more done in any one day than anyone I know. Don’t forget to slow down and smell the daisies occasionally! I love to hear about others’ dying experiences as I don’t really lean towards that myself. I agree with you that we need more time in the day – even though I am not as adventurous as you, I still run short of time! I have had a few days of downtime here, even took in the June potluck dinner at the Saskatoon Quilter’s Guild last night – such a great group of ladies and so inspiring! I am back in the studio now and with the sunshine and warm weather it is time to get my “old”indigo dye vats revitalized and new vats started! Can’t wait to see new dye results. Stay tuned! Images to follow very soon!